The Kingdom of Virgo has lived in peace for thousands of years...until now. In the Dark Forest, a powerful potion-maker has been murdered. But on coronation day everything changes. Princess Azure isn’t who she thought she was, and that’s a big freaking problem. Another awesome book by the amazing Sarah Noffke! Every book she writes draws you into the world she has created & you just can't put the book down until you finish! Oriceran is a new world to me, but Ms. Noffke makes it seem real right away. Princess Azure is soon to become Queen of Virgo, but she can't quite figure out why her mother is stepping down at such a young age. In fact, Azure hasn't even gotten her Soul Stone yet, so she still hasn't gotten all of her magic. At her coronation, her Soul Stone emerges and all hell breaks loose. Her stone is the wrong color and proves that she is half human! On top of this, her mother reveals that she is sick and slowly losing her magic. Azure finds out that her mother has given her Soul Stone to Azure's father and if she doesn't get it back, she will soon die. Azure has to travel to Terran to find both her father and her mother's Soul Stone before it's too late. Azure's childhood friend, Monet, finds Azure as she enters the Dark Forest and the quest begins! Soon, they meet a gnome, a half-elf, mermaids, and other mysterious creatures. I love the characters that Ms. Noffke creates, especially Monet. He is totally irreverent and pretty amazing in his own way. 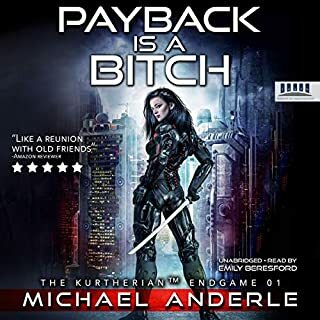 I truly enjoyed the way that the authors worked pop culture into the book when Azure and Ever (the half-elf) go to LA to get Azure outfitted in an appropriate way for her trip to Terran. There were plenty of LOL moments as Azure is exposed to hair dye, makeup, frozen yogurt, cars and just humans in general. And, Monet's growing obsession with Cheetos had me laughing every time! Ms. Robins does a great job with the narration and was perfect for this book. Even though I had read the book previously, her performance made a great book even better! I hope that Ms Noffke has the next book in this series out soon.....can't wait to see what happens next (or who she might kill off!). I was given the chance to listen to the Audible version of this book by the author and chose to review it. I listened to the audiobook version of "House of Enchanted: The Revelations of Oriceran". The story is interesting and fun, with a slightly whimsical fantasy story. It has an interesting way to blend today's Earth with a fantasy setting - that was one of my favorite parts of the story. The story focuses on the wizards of Oriceran. The world is consistent, and I like how the different factions are differentiated. The various characters each have their own voice. I also enjoyed the unique twist that soul stones added. The story is light-hearted, and while there is tension it is not of the "at the edge-of-your-seat" level. Solutions to problems are found somewhat conveniently. If you're looking for a light and enjoyable fantasy story, this will help you pass the time. If you're looking for something more serious, you probably won't care for this story as much. As for the audiobook quality, the recording was well done and the narrator (Carly Robins) did a good job. Ms. Robins had several distinct voices that she used to good effect to differentiate speakers. Voices and tones were consistent, and the words were easy to understand. I personally didn't care for the tone used for the main character's voice, but that's a personal preference. 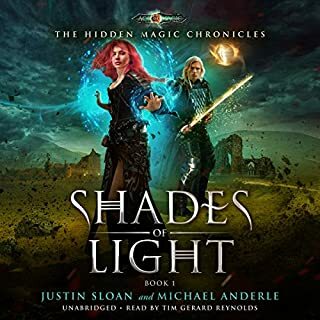 Overall, the audiobook is a fun, lighthearted fantasy story with a strong audio production value. In the world of Oriceran there are two major races: The people from Virgo, wizards, and witches living in harmony with nature; and the Terrans, humans whose origins are Earth, and which use the power of nature for their own benefit. Princess Azure will soon be the queen of Virgo, but during the coronation ceremony, something is discovered about her. She will need to demonstrate to her people that she is a valid queen, but she also will need to recover something for her ill mother and fight back the Terrans and their evil plans. I have already listened to several series by Sarah Noffke, and I love her way of creating characters and bringing them to life. She has a very powerful imagination and is able to create different and credible worlds. Up to now I just knew her books about Dreamtravelers, so I was curious about this new adventure. I have to say that I really enjoyed it, but there was somehow something missing that I found in her other books. I found the main character’s personality a bit less attractive than the main characters’ in her other books, and I also missed a bit part of the balance and poetry. I also found the story quite predictable. I’m not saying this is a bad book, it was very good, but I just can’t help but compare it to her other works. We are up here against a fight between good and evil, non-humans and humans, nature and technology. This dualism has been used again and again since the early times of the first fantasy books and works, but I just maybe expected a more original approach. This is just the first book in a series, and it ends on a massive cliffhanger. I would have appreciated if there was at least a conclusion to the first story-arc. Carly Robins delivered a wonderful narration. Giving a different voice and style to every character. Simply perfect. Despite the minor issues, I am curious about where this is going to, and I am sure the best is yet to come. 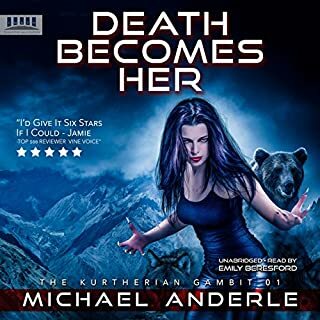 This Audiobook was provided for review by the author/narrator/publisher. In a world where magic is the way of life, Princess Azure is not ready to be Queen of the Kingdom of Virgo​. But when her mother tells her that she is sick, as are many of their people, Azure has no choice but to step up to become Queen. 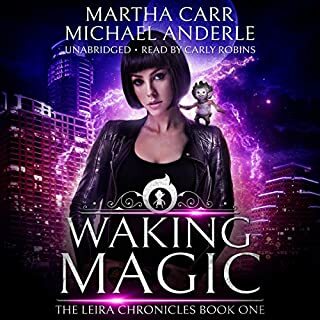 But when Azure finally gets her stone of power during her coronation ceremony, she learns an important truth about herself, one that leads her and her best friend Monet on a quest to save their people. 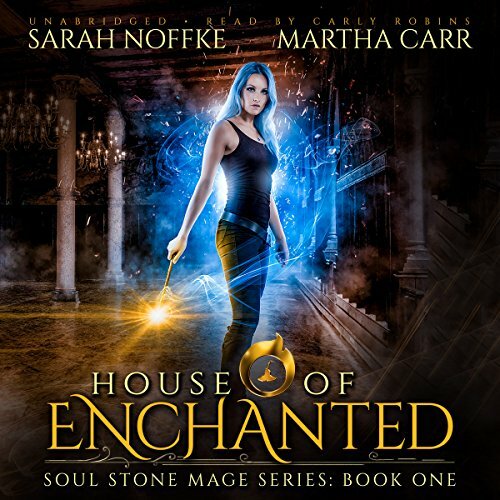 I have been wanting to read a book by Sarah Noffke for years so when the opportunity to listen to the first book in her fantasy series arose, I was super excited. Also, when I saw that is was the real of Virgo I will admit to being exciting to see my horoscope sign pop up in a book so I was sold regardless of the rest of the content. I found the book to be very quick read, only 4.5 hours listening time, which is basically a day listen compared to so many other longer books- a perfect quick read. The world was very different, kind of like a Harry Potter wizarding world-esqe place with magic, witches and wizards, wands and cloaks mixed with a dystopian world, where mankind has split and evolved, and there are cheetos (you know, important things that have been smuggled in). It was a really fun place, with all kinds of magical creatures such as growling poppy plant and gnomes, sharp tooth mermaids and magic crawling all over the place. It was like a funny/random version of the Shannara Chronicles, where magic runs rampant after the world as we know it crumbles. I loved Azure exploring the human world and totally bumbling all human interactions, really the story was hysterical. If this was a movie, it would be rated R due to the number of F bombs dropped all over the place, which was a little surprising to me considering I thought this was a YA fantasy. Otherwise, the content is perfect for anyone or age looking for a fantastical adventure. The banter between Money and Azure was hysterical if at times inappropriate, but totally worth it. The random cast of characters that Azure and Monet collected along their journey were interesting and quirky, making the adventure that much more fun. Oh mg Geez, the journey to Universal Studios and explaining Harry Potter to Azure was awesome and ridiculous. But now I know that to be human you need to wear uncomfortable clothes and you can get a fake ID from the wizarding world of Harry Potter! 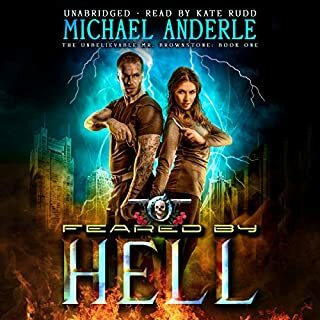 Overall this was a fun, very different fast read and I highly recommend it as an audio book since the narrator created personalities and tone for everyone. I look forward to more adventure to come. Definitely read (listen?) to the authors notes at the end of the book, they are interesting and entertaining. What happens when a wizard, witch, gnome and elf go on a journey? Well, read the book and find out! I love the story line and the unique characters. Although the narration was good, her character voices all sounded very similar. This story follows Princess Azure's quest to save her mother and protect the crown. The world building and characters had me entranced - the language not so much. It is mentioned that witch's are foul mouthed but in my opinion the F bomb was dropped unnecessarily and way to often. The narrator is fantastic with easy to understand and distinguishable character voices. I look forward to more in this series and from this author. My seventh read from author Sarah Noffke and the first collaborative effort of authors Sarah Noffke & Marth Carr. AMAZING READ! Well-written with well-developed, memorable characters. An exciting, enjoyable read. Narrator Carly Robbins adds greatly to the book’s enjoyment. I can’t wait for the next book. This audiobook is an easy and enjoyable listen, but where are the sensible people? The heroine is 100 years old but acts like a young teenager. 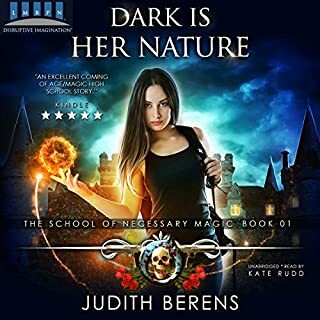 Admittedly, the author says that she is the equivalent of a teenage witch, but why don't Oriceran witches age mentally or emotionally in a normal fashion? That is never explained. Nor does the premise seem reasonable, since life experience is what causes maturity. Do their brains just not develop good reasoning until 100, similar to human teenagers? Then what excuse do her mother and grandmother have for their immature behavior? Both her mother and grandmother have hidden secrets from her - and the reasons for that are either not explained or not good - and those secrets cause an enormous amount of trouble not only for Azure, but for her whole country. The book ends very abruptly with very little resolved. I don't mind series books that take time for resolutions, but this one is not handled gracefully. I have not read any other books in the Oriceran saga yet, so perhaps I am just missing some of the world-building, but this seems a very light-weight book. I have enjoyed other books by Sarah Nofke, but this book doesn't have the developed characters I am used to seeing from the author. Hopefully, the series will improve as it goes along. I am in love with this book series, very exciting! I really like the plot and the caracters, overall a very good book! Having recently found out about the Oriceran Universe, I have become addicted to the stories by the many authors in the universe. This is another great addition to the world and we find out more about the different inhabitants of Oriceran.